Buffer PBS (pH 7.3) containing 1% BSA, 50% glycerol and 0.02% sodium azide. * OriGene provides validated application data and protocol, with money back guarantee. 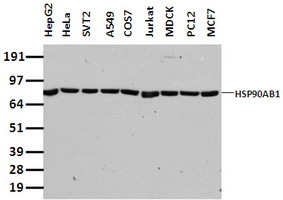 Western blot analysis of extracts (35ug) from 9 different cell lines by using anti-HSP90AB1 monoclonal antibody. 京ICP证07031721号 Copyright © 2019 北京傲锐东源(OriGene Technologies)生物科技有限公司,All Rights Reserved. 法律声明.